CRIRES model-based computer-generated impression of the Plutonian surface, with atmospheric haze, and Charon and the Sun in the sky. Gregory Benford reviews science fiction’s most imaginative uses of Pluto for Smithsonian’s Air & Space, and explains how the New Horizons mission will affect future science. This is the last planet we’ll see up close for the first time—at least until we can send starships to other suns. We can expect, when New Horizons’ flies past Pluto, some confirmations of our many theoretical models. Far more important, we can expect surprises. First will come fresh pictures. Then will come streams of data about the fields and particles surrounding the planet. From that we can fashion a deeper understanding of this small, dim, world. What we learn will apply not just to Pluto and our own solar system. Soon we’ll have many more to deal with. The Kepler spacecraft and other telescopes have found more than a thousand solar systems around distant stars. To puzzle out how they form, understanding our own is essential. Only by such comparisons can we learn whether life is widespread in our galaxy. This entry was posted in Deep Space 770 and tagged Gregory Benford, Pluto by Mike Glyer. Bookmark the permalink. It is a pretty picture, but not quite big enough for a desktop backround… Interesting read nevertheless. It’s by no means the last new planet we’ll see until we can go interstellar. There are estimated to be as many as 200 dwarf planets like Pluto in our own solar system, so there’s still plenty of scope for exploration. We’ve sent probes to perhaps 5% of the planets in the solar system (if you count dwarf planets), and we probably still have 80% of them to discover at all. Eris, Haumea and Makemake have already been accepted as dwarf planets. It’s the last object-that-most-of-us-grew-up-thinking-of-as-a-planet that we’ll get to see close up for the first time. Tuomas, if you like the picture, there are higher-resolution versions available in “wallpaper” formats here. It came from the European Southern Observatory; sadly, they don’t credit the artist. 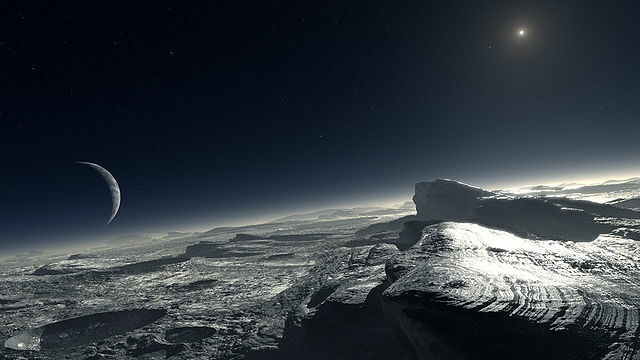 The picture illustrates a 2009 announcement that the CRyogenic InfraRed Echelle Spectrograph (CRIRES) mentioned by Mike in his caption, an instrument attached to ESO’s Very Large Telescope, had measured the lower layers of Pluto’s atmosphere for the first time. Here’s that press release. If I don’t stop myself, I am liable to blather on about how the New Horizons spacecraft will measure the Plutonian atmosphere in two different ways during its Bastille Day flyby. Which is not what you came here to read about. Bill- Blather away. And begin preparing your Pluto talk for Windycon. A song with footnotes even. How fannish is that? Unless JPL/NASA can successfully program New Horizons to alter its trajectory to a farther dwarf-planet target after is high-speed fly-by of Pluto, it may be the last new planet most of us can expect to see. Those 200 dwarf planets are all very far away. Even if New Horizons is give a new destination, it will be years before it gets there. A brand new launch would take even longer … and there are no plans for one that I’ve heard. So let’s say the next window of opportunity is maybe 8 or 10 years from now. I think most of us, even though fandom-as-we-know-it is aging fast, will be around, and may be aware enough of our surroundings that we can peer over our oxygen tanks to watch the vid. If someone launches a new Kuiper Belt probe in those few years, then we will probably have to do our best to hold out for 15 to 20 years to see what an egg-shaped dwarf planet looks like. No matter, we’ll probably have our attention held by Europa-drillers, Titan amphibious craft, Jupiter balloons and Venus crawlers in the mean time. I’ve been reading up on the technical side and soaking up NASA teleconferences to get ready for Pluto. I’ll be cooking up a talk to give after the encounter at Musecon, Worldcon, and, if you like, Windycon. Unlike, say, the Voyager flybys, the New Horizons spacecraft (being small, very far away, and limited in transmitter power) has a very modest ability to communicate its results. On 14 July,the day of its flyby, it will gather an enormous amount of data. But it will take several months to stream all the images, particle measurements, ultraviolet spectra, etc. back to Earth in compressed form. After that, NH will begin sending its data back again in uncompressed form. (As anyone who zooms into JPEGs knows, a certain fuzziness is the price we pay for the convenience of compression.) There are two 8Gb solid-state recorders, monstrous by spaceflight standards, in which data will be stashed until the months of playback are over. What all this means is that we will see very few new pictures of Pluto, Charon, and the rest during the week of the flyby. Instead, new information will appear over the course of months. So instead of binging on Pluto discoveries, we’ll experience them in a gradual stream every so often, as novel results reach the ground. File 770 and other publications will probably feature such things on an irregular basis througout 2015 and 2016. If, say, Plutonian craters are discovered which resemble Ray Bradbury’s spectacles, I’m sure you’ll read about it right here. Further burbling may be found– oh, did I mention that I’m now writing for the Vatican Observatory Foundation?– here and here.